Nightingale Hall is the home of the Nightingales located between Riften and the Shadow Stone. The entrance to Nightingale Hall is a rather steep and narrow incline, illuminated by fissures in the ceiling and decorated with Nightingale sigil banners. The narrow trail opens to the hall: an impressive cavern, complete with waterfall and rushing stream. Going across the wooden bridge spanning the stream, you will reach the living quarters. A small round table offers grilled leeks, and a cooked beef, a wedge of Eidar cheese and bread, and a bottle of wine. A bookshelf holds some reading material, and an unlocked chest at the foot of the bed holds some gold. The next bed over has an end table with a copy of the Pickpocket skill book Purloined Shadows. The end table has nothing in particular. 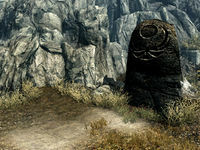 The next room is the circular armory with the three Nightingale Armor pedestals; the armor having been removed during the course of the related quest. The hallway continues northward, but also branches to the northwest and the southeast. Taking the northwest passage, to the left, brings you to an unused training room with discarded practice dummies. On the north wall is a novice-locked chest. The passage to the southeast leads to an additional bedroom with two beds and a bedroll. A copy of the Sneak skill book The Red Kitchen Reader is next to the bed on the on the left. Between the two beds is a novice-locked chest. Continuing on to the north, further into the hall, you come to the Oath room with the three platforms representing the Trinity. While this room is a quiet place for reflection, it holds nothing of note. Early in the game, before Trinity Restored, the entrance is blocked. There are two "Safe" shadowmarks on birch trees leading to Nightingale Hall. 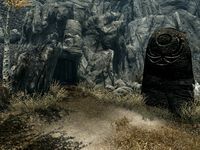 Although Karliah says she will, in some cases she never lives there or visits, unless you finish restoring the Thieves Guild to its former glory and become the Guild Master. In this case she attends your ceremony, then returns to Nightingale Hall, which will now be restored and upgraded. It does not have the Rift set as a parent location. This page was last modified on 30 August 2018, at 22:59.